EasySolv also includes SmartBreaker™ and SmartDuty™. Includes the latest calculation standards for IEEE-1584 and NFPA 70E. Model ANSI short-circuit calculations using momentary, interrupting, or 30-cycle currents for unmatched flexibility. Automatically and correctly selects the fastest protective trip times, no matter how many protective devices. Model differential, partial differential, arc flash sensing, zone interlocking, and other instantaneous sensing devices. Display of bus-based or detailed arc flash values. Direct output of ANSI Z535-compliant labels from spreadsheet to Brady and Dura-Label printers on UV resistant vinyl labels. Detailed spreadsheet provides at-a-glance calculations: NFPA 70E flash boundaries, incident energies, PPE requirements, approach boundaries, and more. Reports can include detailed let-through energy for all devices, worst-case bus or line-side values. Reporting in English or metric units. 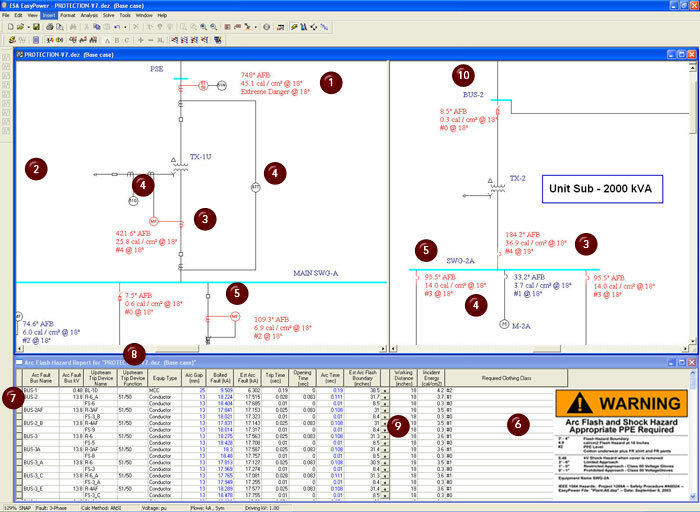 Click on any equipment to create NFPA 70E-compliant energized work permits with built-in templates; they automatically link to the selected equipment. Download a free evaluation copy today. It’s the smartest, easiest way to decide!